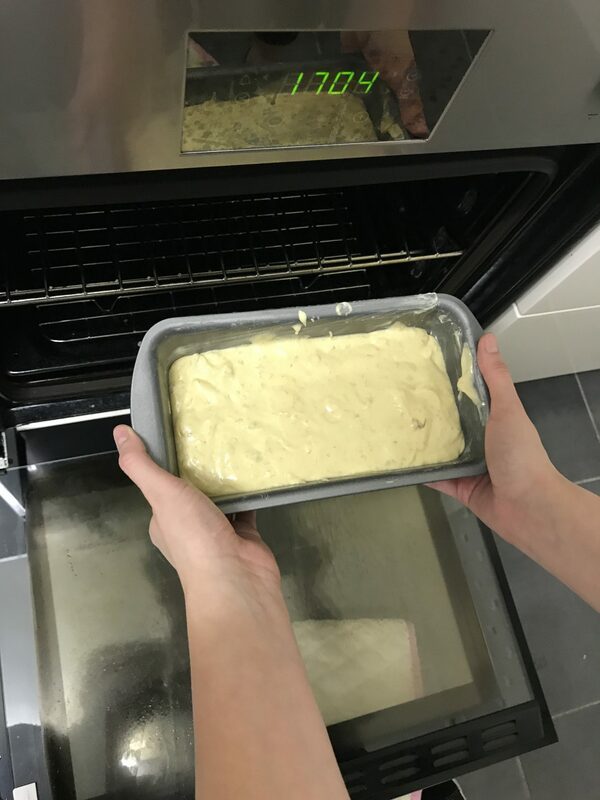 I love baking, I’ve done it with my grandparents since I was a young child and as I am incredibly greedy with a sweet tooth I can’t get enough of it. I’ve baked for school projects, for charity bake days at my Dad’s work and just for the fun of it. Unfortunately at Uni I don’t do it as often as I would like and I have to make do with watching The Great British Bake Off instead. 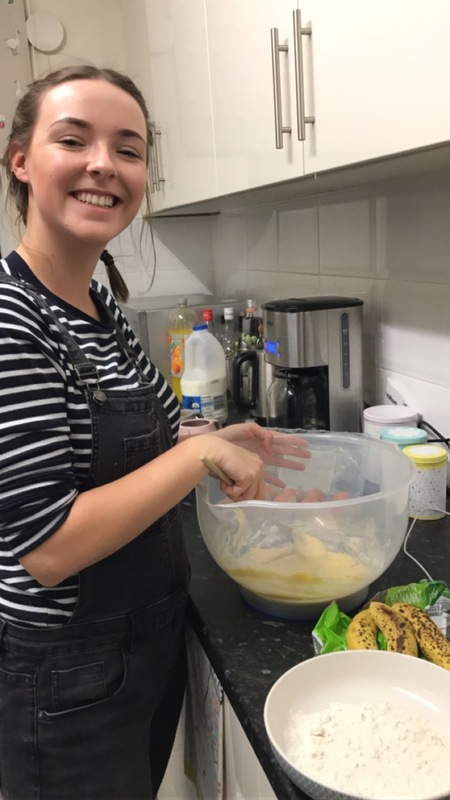 However when Danielle mentioned she had some bananas that were past their best and we realised we both had a free evening we jumped on the chance to bake banana bread! We followed the bbcgoodfood recipe and it worked perfectly and the only thing we had to go to the shops to buy were Eggs (which to be honest we should really have had in). 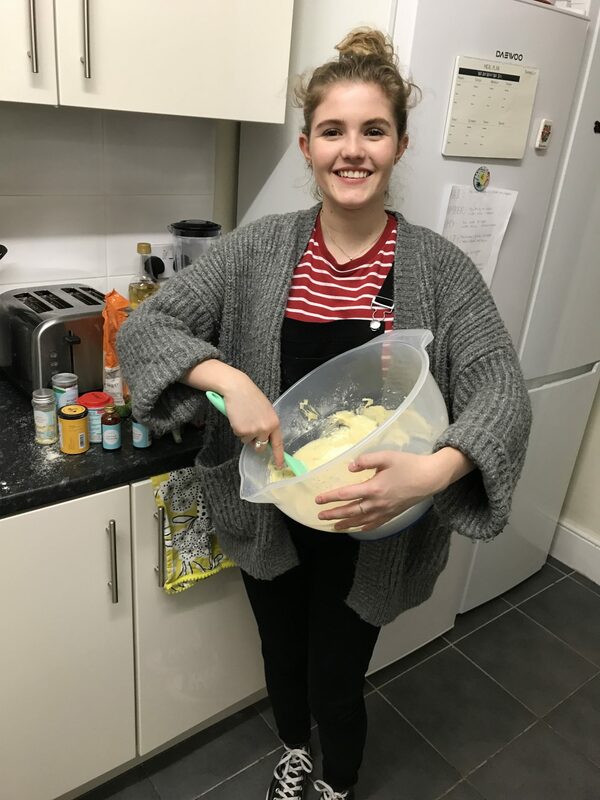 If a pair of students can make it I’m sure everyone else can manage to rustle all the ingredients up as well as you only need Self-Rasing Flour, Eggs, Sugar, Bananas and Butter. While we were on a roll we also decided to make some little buns too, they were just plain sponge which took about 5 minutes to make but the real excitement here was the toppings. 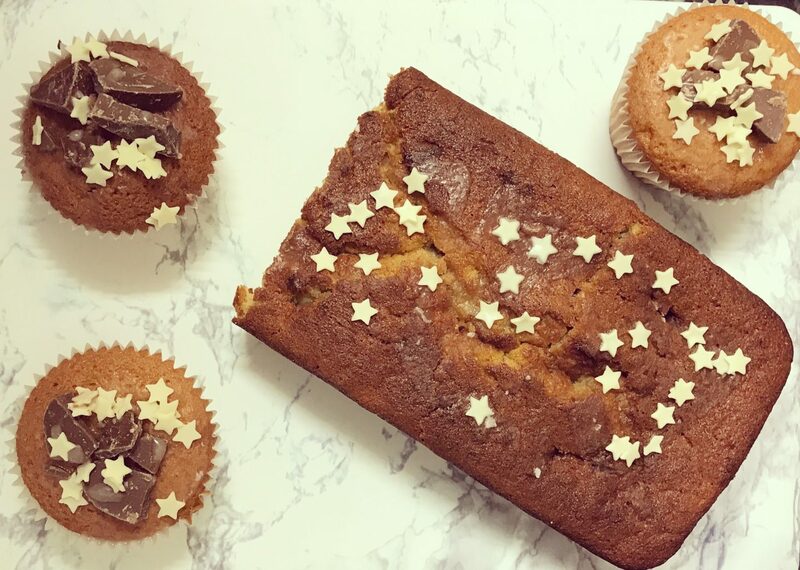 We drizzled the same icing sugar on the buns that we did the banana bread, we then added some white chocolate stars, but most excitingly we sprinkled on chunks of broken up Terry’s Chocolate Orange and if I do say so myself this was a genius idea because it tastes divine. We didn’t really follow a recipe for the buns, we just went from memory but if you have been living under a rock and don’t know how to make buns this is how we did it. Weigh 2 eggs- weigh all your other ingredients to this weight too, you will need Butter, Sugar and Self-Raising Flour. Mix the Butter and the Sugar. Add in the Flour and Eggs and mix until the mixture is light and fluffy. Add in a drop of Vanilla Essence for extra flavour. Divide mixture into bun cases and cook in the oven at 180 degrees until golden. Decorate as elaborately as possible. Although it seems pretty simple we had such a nice night, because one, it feels nice to have made something yourself to enjoy but also two, it felt very Hygge. If any of you have read The Little Book of Hygge you’ll know what I mean but essentially it is a Danish concept of enjoying quality time with a select group of good friends, usually in a cosy setting and often involving homemade food or non-digital activities. Well you can’t get cosier and more relaxed than making homemade buns with your bestie inside on a cold November evening! Unfortunately all the goods are nearly all gone even though we only made them last night (told you I was greedy) but we had a nice night in and it was super cheap too as we already had nearly all the ingredients so a great one for students or to make with kids in the holidays. What is your favourite thing to bake or recipes to follow? Maybe you could make banana bread today to enjoy with a good cuppa! Hahaha thanks glad you enjoyed it! I’m the same I just can’t help myself I have such a sweet tooth! I love seeing all your baking posts and photos, hopefully you’ll be doing some festive baking to get me inspired!